Interactive Mechatronic Performance. 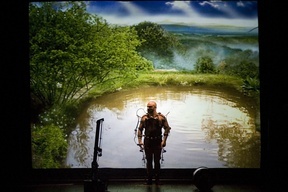 One performer wearing a dreskeleton (an exoskeletal body interface) narrates a myth accompanied by four musical robots, interactive sound, virtual images and video. The onstage action takes place in a rectangular space, with a large overhead projection screen at the back. At the front of the stage there are four musical robots inspired by a guitar, a drum, a set of bagpipes and a violin. Marcel.lÌ Ant·nez Roca, the sole performer, wears an exoskeletal body interface (dreskeleton) made of metal and plastic fitted to his body. This orthopaedic mechanism enables the digital reading of body movements and also of the network of switches measured to the body. Thanks to software written specifically for this work it is possible to process and control the images projected onto the screen in real time, as well as the robots and the music, in other words all the aspects that make up this work. Aphasia is a term meaning an inability to understand thought as expressed in spoken or written word by reason of some brain disease. This title sums up Marcel.lÌ's remarkable interpretation of Homer's Odyssey. The plot of this classical myth has been refashioned into a series of images and sounds that Marcel.lÌ controls by means of the dreskeleton. A sequence of non-verbal situations creates a broken and disturbing narration. The original verse has been substituted by a wide-ranging interactive landscape. The spectator is situated, for example, on a psychedelic island of lotus-eaters, or watches Circe in an animated cartoon version or yet again, the sirens consummating an orgiastic ritual. 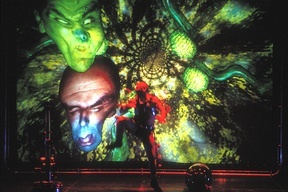 This performance has been awarded many prizes: the Best New Media in Montreal in 1999, the Aplaudiment Arts Parteatrals FAD in Barcelona 2000, the Premio Max for alternative scenic arts Spain 2001. To date it has been performed in cities in Spain, Norway, Italy, Sweden, France, Canada, Portugal, Holland, Germany, Greece, Denmark, Russia, Switzerland and Korea. Music: Alain Wergifosse con Sergi Jordá & Ian Briton. Actors: Albert Anguera, Eva Antas, Marcel ·lí Antúnez Roca, Susana Barranco, Laura Hernández, Companyia Skrot, Marga Socias, Toni Tomàs, Magí Valls. Disseny (Sabadell-Barcelona), Festival de Teatre Visual i de Titelles (Barcelona) & el Institut del Teatre de la Diputació de Barcelona. Afasia was included in Programa de Desarrollo de Nuevas Tecnologías de la Sociedad General de Autores y Editores & la Fundación Autor, and Proyecto Arte & Tecnología para la Fundación Telefónica.